Application: Used for finished drywall corner ,for example, wall paper surface or painting　surface or any other wall surface. Keep corner stronger and beautiful. 40sets/carton. there are 9 pattern for color. 1. keep wall surface corner dry and clean! 2. Put silicon sealant onto the back surface with point for 10mm thickness, two point with 50mm distance, at the inside two top of corner with double-adhesive foam tape(2mm thickness), mark the same high with tape measure and pen on the corner, put WPC corner onto the drywall corner and push, don't strike corner before silicon sealant freezing. © 2018-2020 Nantong Xiujun Imp.& Exp.Co., Ltd. All rights reserved. Name : Nantong Xiujun Imp. & Exp. 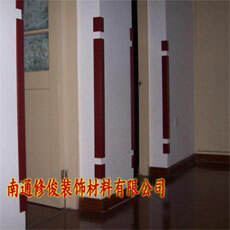 Co., Ltd.
Add: No.9,BULG 79,Suzhedashichang, Rugao City, Jiangsu, China.